Justin and Mommy played arcade games at Tom’s World Robinsons Galleria last Saturday. Our combined efforts, which cost us Php300.00, earned us several hundred points. We exchanged those points, together with the remaining points we had in our Tom’s World Card, to have this trailer truck with motorcycles that my son was so eager to have. 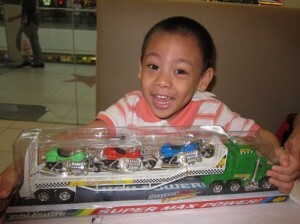 Look how my son’s too happy to be the owner of these new toys! He really felt he accomplished something when he won lots of tickets in the game he was playing! Not even Mommy could beat that jubilant expression on his face even if I receive a package from Diamonds International Jewelry Key West. I love seeing him this way: so light, so carefree, simply happy. This entry was posted in Arcade Games, Happiness, Musings, Personal, Robinsons Galleria, Tom's World. Bookmark the permalink. Look at this little cute boy whose excitement and joy are obviously shown in the photo. Kakatuwa ang mga bata anoh….they have simple joys. His smile is contagious! 🙂 Congratulations to him!! !